There are a lot of simple, easy meals like bean burritos, beans and rice with salsa, cereal with soy or almond milk, frozen vegetables with a teriyaki sauce and rice, baked potatoes with salsa, baked potatoes with canned beans, lots of canned vegan soups, vegetarian canned chili, etc. I've written a few blog posts about eating cheaply, simple meals, and a few posts by college students that may be of inspiration. PETA also put out a vegan college cookbook that is designed for dorm students who only have a fridge and microwave. Lastly, our friends at Engine 2 have a few plant-strong college interns called "The College Greens" and they frequently write about this topic on their blog column. Q: I have frequently heard you say that when people have cravings, they are really just deficient of a nutrient in the craved food (or addicted to the food). At certain times I REALLY crave chocolate — and was hoping that you might know what is in chocolate that I need. I thought that it was iron, but, as it turns out, chocolate really doesn't have that much. Please help! Most of the time the cravings are emotional in nature, and given that we're talking about chocolate and not peas ;) I'd say that might be the case here. Perhaps examine the times when these cravings come on — are they at times of stress? Chocolate is also high in serotonin (which makes one feel happy), so perhaps these cravings come when you're feeling blue? Chocolate is high in magnesium, however, so I suppose you could be low in magnesium... but rice, oats, bran — they're super high in magnesium, so if you're eating those, you should be getting plenty. Soy, dried herbs, nuts, seeds, squash, pumpkin — just to name a few are high in magnesium as well. I would explore the situation around the craving in more depth, and read this post about food cravings and food addictions. I also can't recommendThe Pleasure Trap andBreaking the Food Seduction enough. Q: I want to make the Vegan Sour Cream in HHA, but the recipe calls for firm tofu. When I went to the grocery store, the only tofu they had was extra-firm. Can that work? Yes, as long as it's mori-nu (shelf-stable in a tetra pack), and not the extra firm block sitting in water, refrigerated. There are several single-serving recipes on the blog (Single Serving Blueberry Muffin, Single Serving Brownie, Single Serving Cupcake, Single Serving Fruit Crisp and Single Serving Pumpkin Muffin) and in my cookbooks like the single serving brownie in HHC and the mug cake in EHH. Enjoy! Q: I'm deathly allergic to soy and peanuts. I've been told that those are the main sources of protein in vegetarian and vegan diets. Is that true? 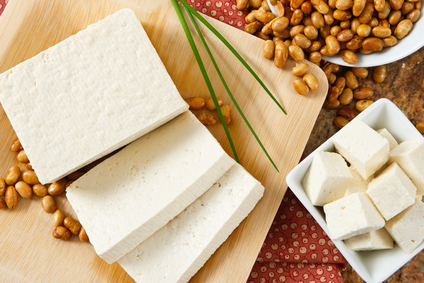 What are some vegetarian sources of protein that don't contain peanuts or soy? Absolutely not true. You can be vegan, vegetarian, etc. and never eat soy. Our meal plans, which are 100% plant-based (vegan) are soy-free. Over 85% of the recipes in all three of my cookbooks are also soy-free and vegan. Protein exists in all foods we eat. You could eat nothing but potatoes all day and still exceed your protein needs. Many plant foods contain more protein calorie for calorie than meat, too! For more information on protein, see my Herbie 101: Vegan Nutrition post.